As a student researcher, Karly Cohen studied how filter-feeding fish taking over the Mississippi River Basin are able to eat so much. As an underclassman, Karly Cohen wasn’t sure what kind of career she wanted to pursue after graduation. All she knew was that she loved biology and signed up for every class on the subject she could fit in her schedule. During the spring of her sophomore year, Ms. Cohen took a comparative anatomy class with L. Patricia Hernandez, associate biology professor, and became fascinated by how form and function impact an organism’s biomechanics. She dedicated the rest of her academic career at George Washington University to learning all she could about silver carp, an invasive filter-feeding fish with anatomy that enables the species to out-compete native fish for food. “I knew once I was in there this was exactly what I wanted to do,” said Ms. Cohen, B.S. ’17, M.S. ’18. Silver carp filter water through modified gill structures and feed off the microscopic phytoplankton they take in. The species, native to Asia, was introduced to the United States in the 1970s to help wastewater treatment facilities keep retention ponds clean. Flooding allowed the fish to escape into the Mississippi River Basin, where they expanded their territory through connected waterways. In the decades since their escape, silver carp have created a significant disruption to the ecosystem. 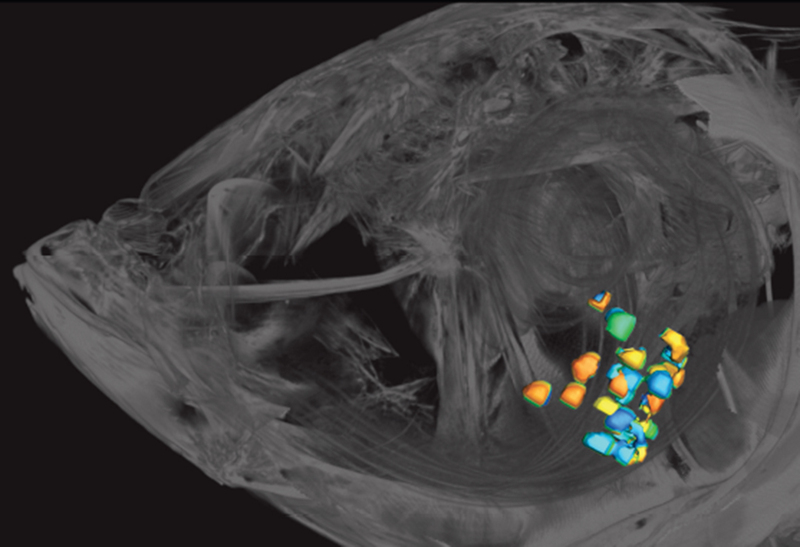 A CT scan of a silver carp shows where filtering plates affect the movement of water during filter feeding. Colored particles show vortices of water that are created by the complex topography of the filtering plates. These vortices bring small food particles in contact with the filtering membrane. (Photo provided by Dr. Hernandez). Ms. Cohen and Dr. Hernandez set out to determine how exactly these fish, which can grow up to four-and-a-half feet long, are able to filter such tiny particles out of the water. The pair made enlarged, 3D-printed versions of the silver carp’s stiff filtering plates and put them in a flow tank seeded with particles. This allowed them to study how the plate’s complex structure affected the water as it moved past these plates as it would during natural feeding. Ms. Cohen and Dr. Hernandez used this modeling methodology to determine how the fish traps particles using mucus-producing tissues and disposes of filtered water and other sediment. They wrote about their findings in the Journal of Experimental Biology last year, and the paper was selected to appear on the 2018 Journal of Experimental Biology Outstanding Paper Prize shortlist. Their work also resulted in two additional papers, one detailing the bizarre anatomy of the head that is responsible for catching and concentrating these tiny particles, and another paper describing how the filtering plates develop. Over the last few years, Dr. Hernandez and Ms. Cohen have fostered a strong academic partnership. Ms. Cohen threw herself into student research and was awarded a Wilbur V. Harlan Research Fellowship. She went on to present her work at Research Days in 2017, where was recognized as the top undergraduate presenter in ecology and evolutionary Biology. That year she also received a student profession and career development grant from the Shenkman Career Services Fund. As a student in the combined B.S./M.S. in biology program, Ms. Cohen continued her work while obtaining her master’s degree at GW. She is currently a Ph.D. candidate at the University of Washington studying biology. For her dissertation, Ms. Cohen is taking what she learned at GW about how to ask questions about evolution and functional morphology to study what happens when form and function don’t align. Ms. Cohen continues to work closely with Dr. Hernandez. They are currently writing two more papers that they plan to submit for publication this spring and are brainstorming at least three more. Every time they attempt to answer a question about the silver carp, they end up on a new path ripe for discovery. “Students interested in research should not to be shy about approaching faculty and getting involved in their labs,” Dr. Hernandez said. First-year students and sophomores don’t need to wait until they’ve taken a bulk of their core coursework to find meaningful ways to contribute to ongoing research. “It’s never too early to begin,” Dr. Hernandez said. To learn more about available reserach opportunities contact the GW Center for Undergraduate Fellowships and Research. Helena Salvi, B.S. ’18, combined engineering and biology to tackle interdisciplinary research projects at GW. A student group is launching a new academic journal for undergraduates to showcase research papers. Research with faculty mentors has shaped the undergraduate experience and future career paths for many GW students. The teaching facility and open-air space fosters a wide range of biological sciences research.